The historic Kandaswamy Temple stans at Nallur 1 1/2km from Jaffna on the Point Pedro Road. The temple was built in the 15th century, by Sanpaha Perumal the adopted son of Bhuvanekababhu, the king of Kotte, who led an expedition to the North and brought Jaffna under the suzerainty of Kotte. Having established himself as the ruler of the Jaffna Kingdom, Sanpaha Perumal set about the task of building the city and erecting the temple. Then he appointed Vijayabahu as the ruler and returned to Kotte. After some time, the deposed king Kanagasuriyan attacked and drove away the invader, He and his descendants managed the Nallur Temple up to the arrival of the Portuguese. Bhuvanekabahu's name nae is still mentioned by the ssher on ceremonial occasins. The Portuguese defeated Sankili, the last king of Jaffna in 1560. The Portuguese General Philip de Olivera demolished the historic Kandaswamy Temple in 16210 the temple then stood at SANKILI thopu on the eastern side of the Point Pedro Road (The site was later used for erecting a Christian Church). Jaffna, like the other maritime districts, fell to the Dutch in 1658. The Dutch were more tolerant than the Portuguese. Don Juan Ragunatha Mappana Mudaliyar was were shroff in the Kachcheri (and hence an influential person) obtained permission from Government to rebuild the temple. The temple was built in stone and brick in 1734. His decendants have, to date been, trustees of the temple. The present incumbent Kumaradasa Mappana Mudaliyar enjoys a reputation for punctuality and discipline. He has, during his period of office, been effecting additions and improvements to the temple, making it spacious and accessible to the very large crows that throng during the festival. The very atmosphere of the temple breathes holiness and peace. In punctuality, order and neatness, Nallur provides a model for all Saiva temples. 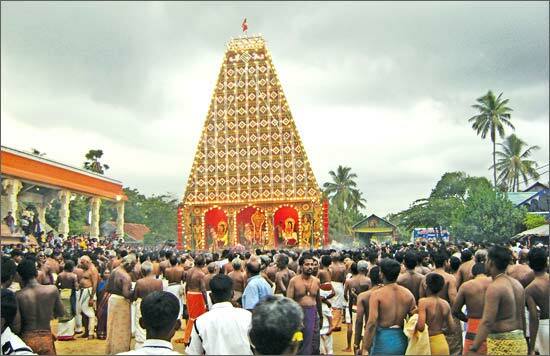 This is one of the few temples the conduct the stipulated nithya akkini and nithya utsawam daily. Tuesdays and Fridays withness a large numbers of devotees. 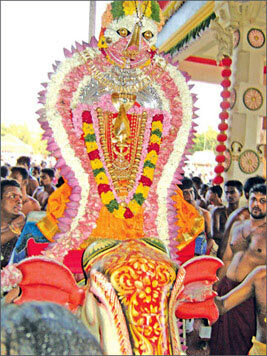 Each (lunar), month Tirukarttikai is of special significance. It is Lord Muruga's day. The pageant of the vel with Valli and Theivayanai is enthralling. At Nallūr Kanta Cuvāmi Temple, Jaffna, vel alone is the mūlamūrti. According to the Yālpāna Vaipava Malai, the origin is attributed to Bhuvenaka Vaku, Chief Minister to Kulangai Ariya Cakravarti, who reigned at Singai Nagar. However, several references give the entire credit for building the city of Nallur and the Kanta Civāmi Temple to Sempaha Perumal who ruled at Nallur under the name of Bhuvenka Bahu for 17 years from 1450 AD (Mayilvagana Pulavar, 1739). In the battle of Vannarponnai after Sangili Kumara's defeat, the former Kanda Swami temple was leveled to the ground in 1620 by Philip de Oliveira, leaving	no traces of its foundation. The present temple at Nallur originated during the period of Dutch rule by the effort of Mappana Mudaliyar. This temple may be said to be the most popular place of worship in the whole of Jaffna peninsula, with peak level of up to one million devotees at festival time. The origins of the Nallur Kandaswamy Temple are traced back to the 15th century when it was built by Sanpaha Perumal, the adopted son of King Bhuvanekabahu the King of Kotte. The temple which was at Sankili Thoppu was demolished by the Portuguese General Philip de Olivera in 1621. The Dutch took over the Jaffna District in 1658. A church was erected in the site at Sankili Thoppu where the temple stood. 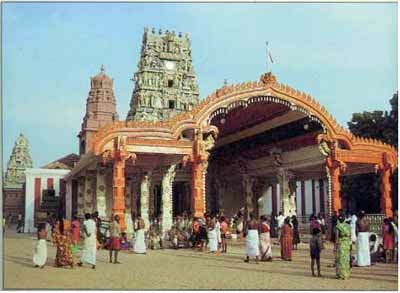 It is believed that the first temple was built in 948 AD on the land called ‘Kurukkal Valavu’ Due to foreign invasions the temple had to be re-constructed several times in different places. 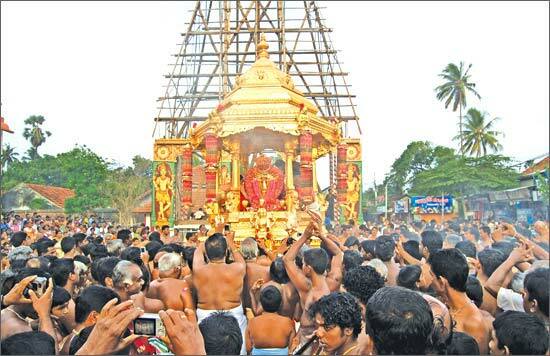 Due to political reasons the Temple was shifted from place to place in Nallur area. It is believed that there was a shrine dedicated to an Islamic Sufi Saint located within the complex from 1734 to 1749 when the temple was built. This was relocated in 1749 when the Temple was built. The fourth and the present temple was constructed in 1749 AD during the Dutch period by Krishna Suba Iyer and Ragunatha Māpana Mudaliyar in the ‘Kurukkal Valavu’ which was the original premises of the temple. Ragunatha Māpana Mudaliyar was the Shroff at the Kachcheri, Jaffna. He had a good rapport with the higher officials of the Kachcheri. He obtained permission from the government officials to rebuild the temple. The Temple was initially built using bricks and stones and it had a cadjan roof. The original shrine had only two main halls and there was no clock tower or any surrouding courtyard or enclosing wall or any ornately carved towers or Gopuram. The first clock tower was erected in 1899 and the main hall where the Vel or lance of the deity resides was refurbished using rocks in 1902. The first enclosing wall was erected in 1909. The descendants of Ragunantha Māpana Mudaliyar have been the trustees of the temple right along. The present incumbent Kumaradasa Māpana Mudaliyar has been gradually renovating the temple from time to time making it spacious and accessible to the large and unmanageable crowds which throng the temple during festivals. In 1964, the “Vasantha Mandapam” or grand hall was renovated to have the present attractive and grand look. The main entrance of the temple is facing the East. In the main entrance there is on ornately carved five storeyed tower or gopuram in Dravidian architecture style. There is also a small gopuram and six bell towers. The Tamil word murugu means beauty. Lord Murugan is the one who possesses beauty which is perfection. Beauty and perfection are inseparable twins. Where there is beauty and perfection there is Divinity. Lord Muruga is the embodiment of Beauty, Perfection, Truth, Love and Divinity. The divine utterance of Lord Muruga “Why fear when I am here at Nallur” is always ringing in the ears of Murugan devotees. The firm and strong belief of the devotees is that Lord Muruga would extricate / rescue them from all problems sufferings and difficulties in life. 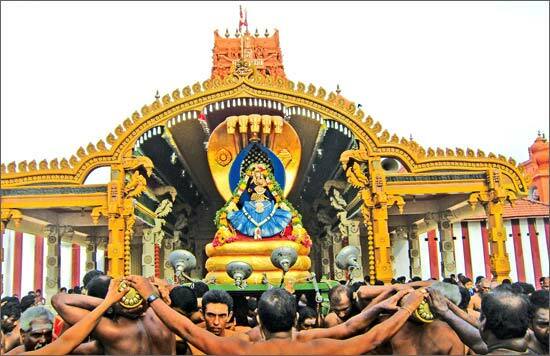 Yogar Swami has said “The moment I think of the Feet of the Lord residing at Nallur, I forget everything. I surrender to Him. He is my Refuge”. I slumber into forgetfulness knowing that He is my refuge." The religious ceremonies are conducted with perfect time management and strict discipline. The Administration of the Temple should be commended for punctuality in conducting poojas and religious ceremonies. Poojas are held daily six times a day with clock like precision. The first pooja starts at 5 a.m. and the last one at 5 p.m. without any delay any time in any pooja. Lord Muruga’s special Poojas are conducted on Fridays and auspicious days of the month. The Annual festival begins with the hoisting of the flag – the Kodietram. 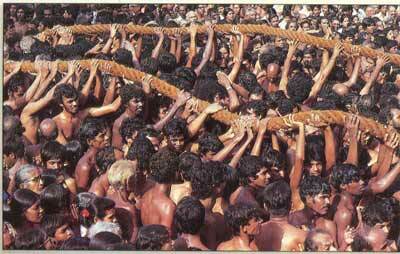 The cloth for hoisting is obtained ceremonially from the Saddanathar Temple in the neighbourhood. This temple was patronized by Ariyachakravarthi – a king of Jaffna. The festival is spread over a period of twenty five days during which period various Yāgams Abishekams and special poojas are conducted. The ceremonies are conducted in the Moolasthānam, the sanctorum. The annual festival is a religious inspiration to all Hindus. During the period of twenty five days of the festival the major religious festivals are – Manjam, Thirukkarthikai, Kailasavahanam, Velvimanam, Thandayuthepani Festival and Sapparam. 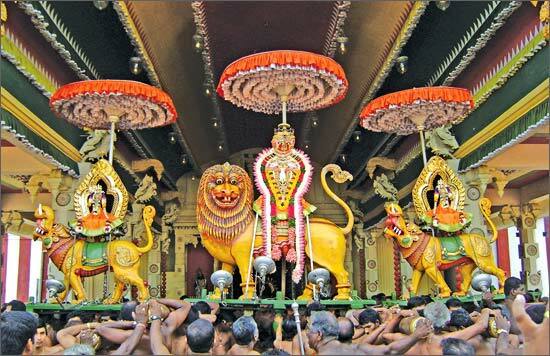 The Ther Thiruvila (chariot festival) is a very colourful ceremony. 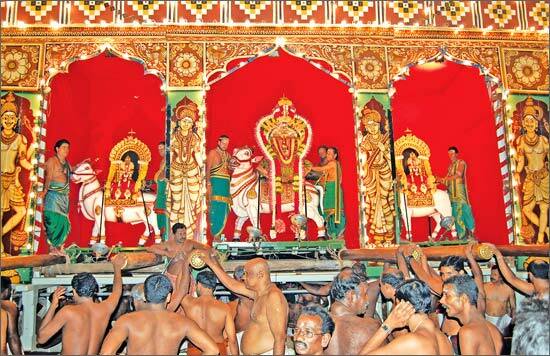 The ther (Chariot) festival commences at the auspicious hour – the Brahma muhurtham. The glamorously dressed Lord Muruga, the king of kins is brought out and placed on a specially and elaborately designed silver throne. 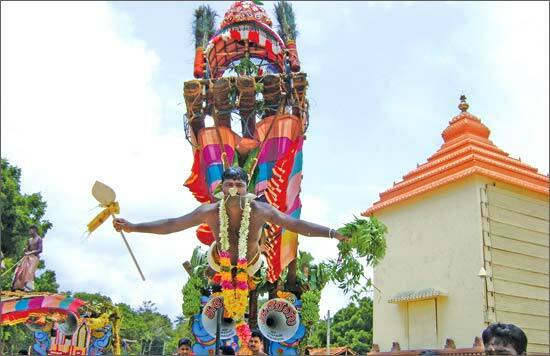 The huge and heavy chariot carrying the statue of God Muruga is paraded along the streets of Nallur shrine It is pulled by a rope by thousands of devotees where the rich and poor, old and young stand shoulder to shoulder in pulling it giving God Muruga the opportunity to witness the sincerity and purity of the devotees. The next day is the water cutting ceremony which is called in Tamil ‘Theertham”. Next day’s ceremony is Tiru Kalyanam which is the symbolic wedding ceremony. The final ceremony is the lowering the flag – Kodi irrakkam in Tamil. These ceremonies have an important role to play. They correspond to the Panchakritiyas or five acts of God vis a vis creation preservation and destruction Chariot festival is reckoned as the top most or highest ceremony. During the festival days the deity is taken round the inner precincts at noon and to outer precincts in the evening daily. 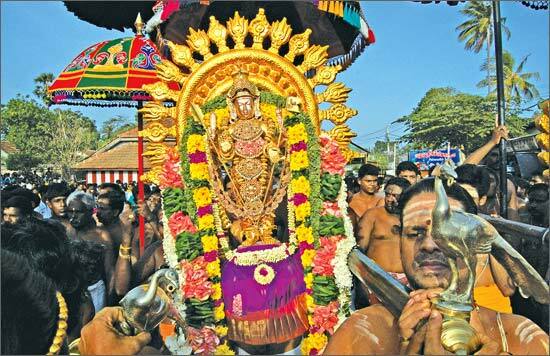 Lord Muruga or his Vel goes round with the consorts Valli and Theivayanai. 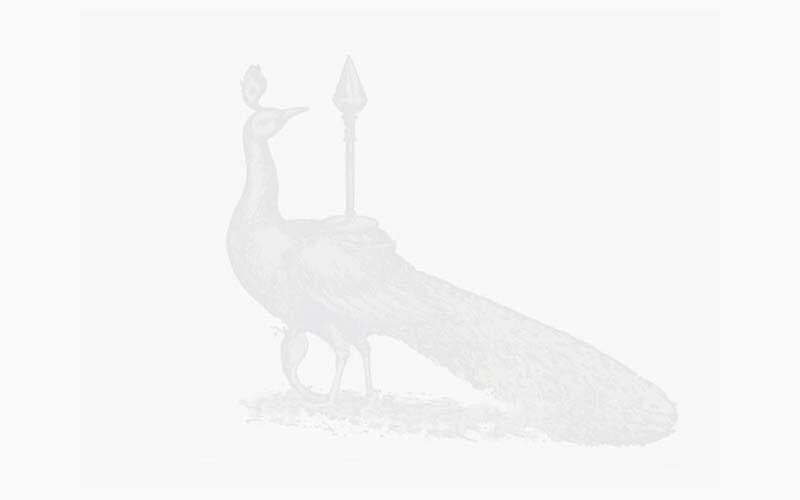 The vahanams (vehicles) are of a rich variety ranging from silver peacock silver swan the cobra the Green Peacock, etc. 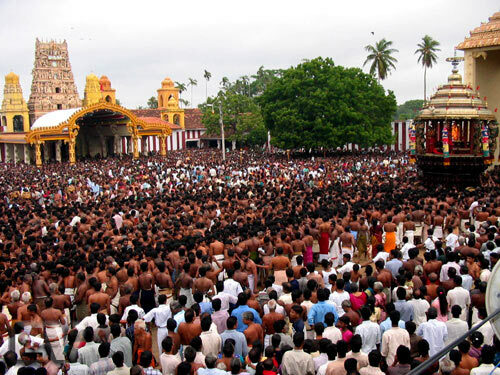 Thousands of devotees irrespective of ethnicity creed or religion from all over Sri Lanka go to Nallur festival. There are several devotees who come from other countries of the world. The devotees go behind the deity shouting loud “Aro hara Aro hara”. The words “Aro hara” had their origin from the words – Hari – Hara. The meaning of Hara is Sivan and Hari is Vishnu. The words ‘Aro Hara’ are a fine blend of Sivan and Vishnu. The shouting of Aro hara is a clear demonstration of the peak of emotional expression of maximal devotionality.